As you are preparing your seder plates this year, take a moment to consider two customs that may or may not be new to your home. The first is placing an orange on the seder plate next to the other symbolic objects. There are two “accepted” reasons for why this is done, both involving Susannah Heschel – a prominent feminist teacher of Torah and daughter of the famous theologian and human rights activist, Abraham Joshua Heschel – and you choose the one that you like.The first is that she was invited to speak in a certain synagogue and was heckled by a man in the congregation who protested that “a woman on the bimah is like an orange on the seder plate”. She subsequently placed an orange on her seder plate that Pesach. The “real” reason, supplied by Heschel herself, is that in the early 1980s, she was trying to find a ritual way of symbolising the struggle by Jewish lesbians and gays for recognition in mainstream Judaism. One Haggadah suggested placing a crust of bread on the seder plate (to symbolically protest the notion that “gays and lesbians are as welcome at the seder as bread”). She found the idea interesting, but felt that since placing bread on the table makes the whole seder chametz, that was exactly what she didn’t want to be saying about gays and lesbians. So at her next seder, she divided an orange into segments and offered her guests one each for all the different kinds of Jews who have been marginalised – gays and lesbians, widows, agunot (women who are “chained” to their previous husbands) etc. The orange symbolised the fruitfulness that Judaism would be missing if it kept these people outside, and the seeds that were inevitably spat out as one eats a segment of an orange were for spitting out all the phobias (xenophobia, homophobia, etc.) from Judaism. Whichever you find more appealing, the fact is that the orange has popped up on seder plates all over the States, UK, Israel and now here in SA, and it’s starting to become a normative feature cuddling up next to the karpas and charoset. The second recent custom is the filling of the cup for Miriam. This is based on a midrash on two verses in B’midbar/Numbers. In the first verse (Numbers 20:1), Miriam dies, and in the second (vs. 2), it immediately states that there was no water for the Israelites and so they come to challenge Moses and Aaron. Noting that the water seems to disappear the moment that Miriam died, the midrash explains that Miriam had a magical well that would follow the Israelites on their journeys – so that they had a continuous source of water. But it was sustained only by the merit of Miriam herself, and when she died, the well disappeared. Water is a key image in the Torah and rabbinic literature, symbolising life and Torah, and Miriam was the provider of both for the children of Israel. The custom is to place a cup on the table and fill it with water, not wine, to recall her role in the exodus, and also to make some small recompense for the fact that women seem to get such short shrift at the seder (Moses, Elijah, lots of male rabbis – not too much mention of women at a traditional seder). So, wherever you are this Pesach, at home or at Aunty Adele’s, why not try out making this seder night different from all other seder nights with the addition of two powerful new minhagim? 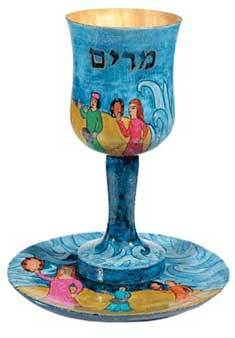 An elaborate, hand-painted Miriam’s Cup by Israeli artist Yair Emanuel. The cup, which comes with a matching plate, shows dancing women.